This 13 7/8" x 8 3/8" original acrylic abstract on heavy watercolour paper is brimming with texture and warm desert colours of terra cotta, purple plum, sage green, cactus flower pink, turquoise, teal and cobalt blues and warm pink and orange sands. Texture was achieved by applying tissue paper to the watercolour paper ground and then adding clear and coloured gesso to adhere and stiffen it. 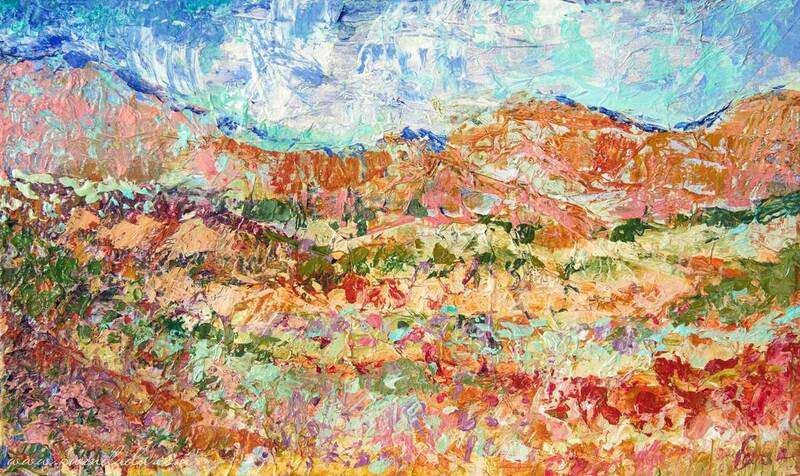 Then colour was washed as a base and a palette knife was used to apply the surface colour. If you love bold warm colour and tangible texture, this piece is for YOU! Painting is signed in lower right hand corner. • 13 7/8" x 8 3/8"